I don't have any children, so I'm not in a position to undermine the difficulty of parenthood. 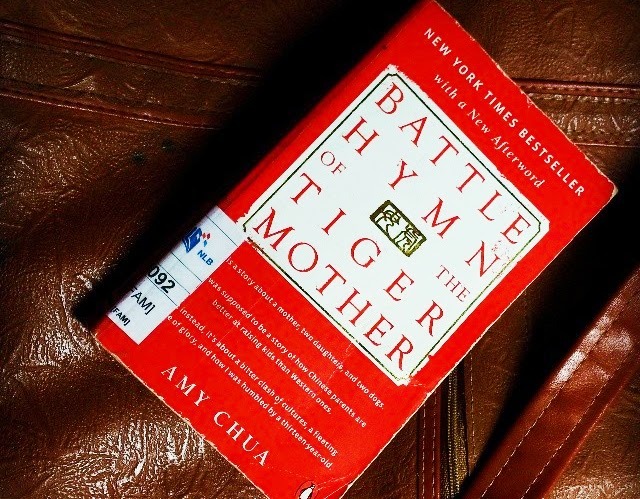 Recently, I got around to read this controversial book – Battle Hymn of the Tiger Mother by Amy Chua. If you’re too lazy to read it, here’s a one liner summary: Tiger mothers, usually Asian mothers, raise better kids. For a better understanding, here’s another addendum on what tiger mothers are. Tiger mother: An extremely strict female parent when it comes to children’s upbringing, academics and development. Now, unless you live in a tremendously traditional Chinese family, you might not understand the definition of “extremely strict”… good for you. Or maybe not. It’s easy to spot the tiger mother. They populate predominantly Asian cities with competitive education systems like China, Taiwan and Singapore. She screams at her child for a single misspelt word in a spelling test, her voice piercing through the walls. Subsequently, you might even hear the sharp smacks of the cane against flesh. Piano classes on Saturday mornings, and Science tuition in the afternoon… not a day is to be spared to while away idly. Not an unusual observation, but anyone would know to turn their eyes away. It is the grand scheme of good upbringing. Taking up the full-time job of a tiger mother definitely isn’t easy. It never stops, not even in her sleep. Everything can be learnt, and everyone has a potential to be good at everything. Only if you worked at it hard enough. If you practiced enough. Human beings are adaptive; they learn through repetition. You might have seen ‘crazy’ mothers with thousands of multiplication sums for their children, but guess what? Their children are most likely to have emerged to be number one in class. It might be a cruel way, to govern education by fear and rote learning. But you have to admit, it definitely works… only if the child has sufficiently gained confidence that this is effective - but this can be controlled. 'Crazy’ mothers do have a point. But there’s only so much you can babysit. There will be a point of rebellion, or a time when the tiger mother lose her drive to continue this tiresome, thankless job. I’ve seen how the children of tiger mothers turned out: it could go both ways. I think, post-emancipation needs some studying, too.